Let’s have a show of hands! Who has taken formal sailing lessons? You know, signed up for sailing camp or school and/or spent a week (24 hours) and learned ‘how to sail’? A few of you, righty-oh. So, it went something like this, based on how it was done at Offshore Sailing School 22 years ago (I worked at the one on the Hudson River in Jersey City). A long weekend, three 8-hour days, first four hours in a classroom, looking at a white board, hearing new terms, some very basic basics, and a bit of theory. Then onto the boats, hoisting sails and taking turns reaching back and forth, apparent wind, points of sail, tacking and gybing. Second day more sailing, getting better at tacking and gybing, telltales, sailing by the lee, luffing, sail trim and so on. Third day more of the same, a MOB drill, a bit on the Rules of the Road and sailing up to the moorings, and your diploma. Now pay attention, because the following is very expensive information wrought over many years and brought to you as part of your subscription to WindCheck. All of this stress, input overload, mild confusion and weariness was brought to you by the following three principles. Three-axis motion. By and large, humans process in two axes: yaw or pitch, left-right or up and down. OK, some folks get three-axis motion a bit but they are highly skilled and trained…I’m thinking F-18 (the fighter jets, not the catamarans) pilots. But by and large only when they are engaged, the rest of the time it is like driving a car. There is the Lexington Ave. downtown express first thing in the morning, but there you are not awake enough for anything to penetrate, ‘cept hanging on and not spilling coffee. Only in sailing do we experience three-axis motion all the time. This is one of the reasons why (when learning) when the boat heels we are not sure what to do, apart from hang on. It’s OK, we learn. Our brains retrain for the extra axis. It penetrates so quickly after a summer by now you don’t even think about it. Inputs. Oh yeah, there were a lot of inputs. In no particular order: Wind: Apparent and true strength and apparent and true angle; the pitch, roll and yaw; pressure on the tiller; other boats, and rocks, docks and so on. The issue here is we are not used to parallel inputs. We usually (multi-tasking at work notwith standing) process in linear or series-one after the other. We wake up, hit the head, clean teeth, shower, dress, breakfast and so on. In sailing, all these are all moving forward all at once and changing every microsecond. It’s no wonder your brain hurts. 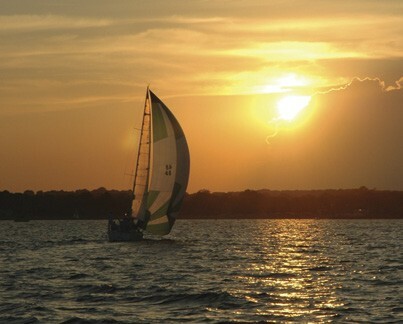 Sailing is the resolution of all the forces acting on a boat as determined through the force on the rudder. And I bet you a bottle of Gosling’s sailing has not been described to you in this fashion. Take a thinking break here for a second. Sailing boats operate based on forces acting on the boat. These forces create a series of vector sums all fighting each other. This is made more complex, since the boat is operating at the interface of two gases with vastly different densities and all the forces are subject to wind speed and direction and these are changing all the time, even minutely. I bring all this up because it has become my default way to describe sailing to people, especially new high school sailors. The forces resolve in the rudder and this ‘pressure’ transmits up to the tiller. We know when the helm feels heavy and wants to pull our arm out. Usually the boat is heeling a lot, too. This is an indication that the boat is unbalanced. Too much heel, caused by maladjusted sails or, often, too much sail for the wind speed. Or, when the boat feels ‘good’ and then a moment later feels not good is usually due to a shift in wind angle or speed and so on. Are you one of those folks who has a large screen displaying GPS, RADAR, AIS, wind and boat speed information and how many sugars the crew has in their coffee and obliterating the view down the boat and blinding you at night? Here is a tip. Turn all that stuff off, yes the meters too. Go sailing without any electronics turned on…well, then after you get out of the harbor. Ever read anything on the nature of Buddhism, and in particular Zen? It’s OK, the kids look at me that way too when I come up with that question, but I have come to the conclusion one of the reasons we feel so great after even just a few hours sailing is because, especially steering, the act of concentrating on the pressure in the rudder is a very Zen-like, ‘in the moment’ moment. Yeah, I know it is changing every moment, but that’s why it is Zen. When you look at the meters, they are telling you what just happened. The pressure in the tiller is telling what’s going on now, so be in the now. That is Zen, being in the now. Think back to a great sail you have had. You came in and said something that included the idea that the boat felt great. Well, you cannot measure a feeling in the same way you can measure any of the physical inputs acting on the boat and her response to them. On the race boats I sail on, the guy or girl driving does not say, “Oh great, we are sailing at 6.23 knots.” He or she will say something like, “Yeah, feels OK,” with “Feels a bit, slow, too fast or sluggish” the most popular. The driver might look at the meters once in a while but in the same way we, when driving a car, do not concentrate on the pavement ahead of us. Rather we scan, taking in all the inputs used in driving. This summer, sail for a while with all the electronics turned off or put a tote bag over the TV screen, and learn to sail by the feel. Wind in your face, neck, side of your head or hair, the angle of heel (roll), the pressure on the helm (yaw), or even the noise of the wake. Notice how the boat feels as the wind speed and direction changes. Much is made in today’s culture about the balance of life. Soccer practice or violin, drive or train, respond to dumb question or let it pass…As with life, so is sailing all about balance in the moment: Very Zen-like.